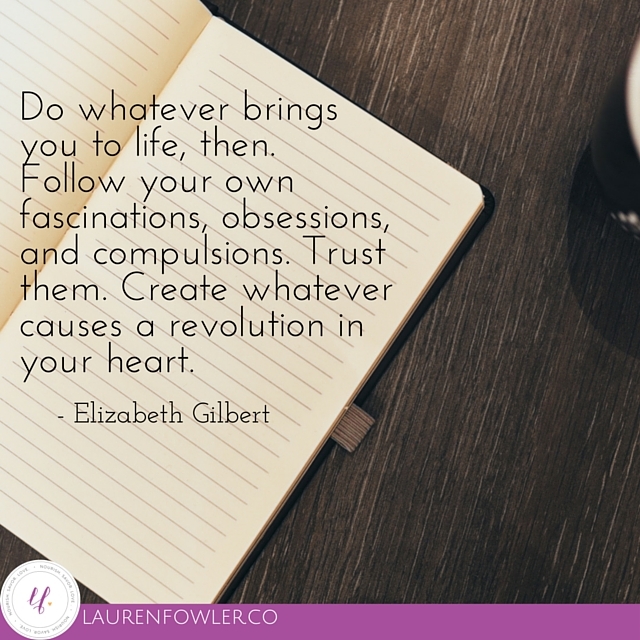 I recently devoured Elizabeth Gilbert's new book "Big Magic: Creative Living Beyond Fear." It really has so many unique ideas and helped me realize where I'm letting perfectionism or fear run the show. There's also power from creating simply for the pleasure of it. Everything I create doesn't have to be (and won't be) perfect! Creativity has been a big part of my whole life, and luckily, I've been able to reconnect to it through creating this blog, my business, and in my personal life. Creativity is our life force. We are all creators in our own unique way, simply by being alive. As a child, I was always reading and writing stories or poems about made-up worlds. I would create games or play for hours with my sisters or our friends - or my personal favorite was creating dances to go along with Backstreet Boys or NSync songs (Bye, Bye, Bye). We could keep ourselves entertained for hours as kids. This creativity was simply what we did - there was no pressure on ourselves to do it "perfectly" or to make money from it or because we "had" to. We were bored and wanted to have fun, so we created. As adults, our innate creativity often becomes blocked because we put a lot of pressure and expectations on ourselves to aim for perfection. We don't want to do art because we like it - we want to be perfect at it. We don't want to sing unless we're actually "good" at it. We don't want to share our writing until it's carefully edited and crafted. For those of us with blogs or businesses, you can spend your life reading articles on online marketing talking about creating the "best" content instead of actually sitting down to write, podcast, or share. We compare ourselves to others, and stop doing what we love. Take a moment to think back to what you LOVED to do as a child. Often, we can find signs of our favorite activities now from our childhood. For me, I've always loved to read and write. Did you love to draw or color or dance or sing as a child? Do it now. It doesn't matter if you're 'good' at it or not. Do it because you enjoy it. That's how you'll get the benefits of creativity - the pleasure and joy from simply creating. Sure, it may not always feel "easy" to write, draw, or be creative, but it doesn't have to be a painful process. You don't have to turn your creativity into a full-time gig or be the best at it to be creative. All you have to do is create. You ARE creative. Start to believe it. By engaging in creativity, you can enter a 'flow' state of your brain. It can become a meditative-like state. For me, it happens sometimes when writing or practicing yoga or dancing. It doesn't happen always, but it's so freeing and joyful when it does. I often get some of my best ideas when I'm creating as well. I could be on my yoga mat and get an idea for a blogpost, and when I sit down to write, the words just flow out of me. Getting creative allows ideas to flow, and you can experience pleasure (that many times people seek out using food). Take the pressure and perfectionism out of creativity, and do it for the joy. Journal about creativity. Ask yourself what things did you love to do as a child. Where do you feel creative? How does creativity feel in your mind and body? Do something creative. No need to set goals or expectations on it. Just do it. Turn on music, and let your body dance or sing. Pick up an coloring book (not just for kids). Sketch or draw. Write. Journal. Notice how it feels to just do it for the fun of it. Try something new. Get out, and do something new like a painting class - I keep seeing those wine & paint classes pop up. Or a different movement class like hip-hop dance or ballet. Or karaoke! Get creative in the kitchen. Ditch the recipe, and play in your kitchen! This is my favorite. Go to the grocery store, or browse your own kitchen to create a new concoction. I bet you can come up with some pretty yummy. Even if it's terrible, you may still have fun creating and playing in the kitchen. How are you going to use the intention of CREATIVITY in your life this week?